Another beautiful day in California, as the clouds dissipated and the cu's started popping. Today's task was downwind to the Porterville Airport via the flats, about 96km. Climbs were really high today (for here) to 7000' in the mountains and 6000' on the flats passing Woodlake, which made today much easier compared to yesterday; the wind was lighter too! 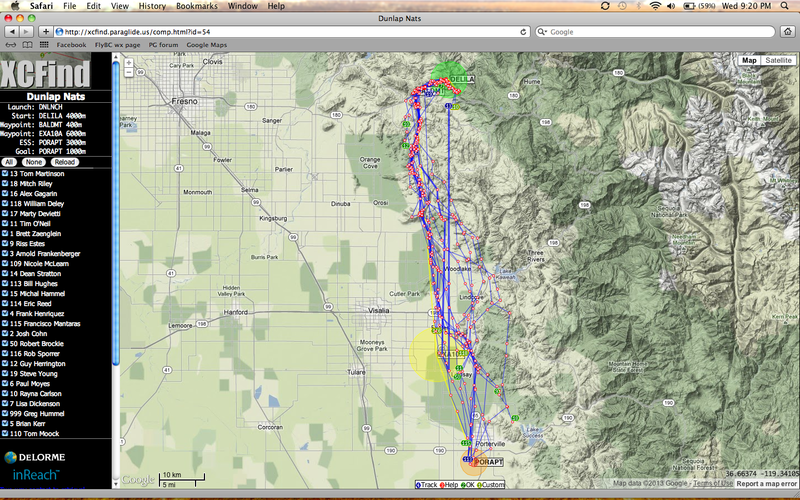 I got separated from the lead gaggle at Orange Cove so Dean and I flew together on a deeper line in the foothills, passing the lead gaggle while they were stuck on a ridge further on the flats. But we all met up just outside Lindsay/Exeter when it was time to push out for the last TP and then it was decision time...do the flats into goal, or return to the hills until goal. While at Woodlake I had noticed haze domes forming and was wondering if something was changing in the airmass; then cu's started popping left, right, and center. Soon the whole valley was full of cu's, so after tagging the Lindsay/Exeter TP it was an easy decision for me to stick to the flats and ride the clouds downwind for the remaining 25-30km. I did get low once, but the flats were delivering low saves all over the place so it was the frisbee downwind until I reached the Porterville airport. Last time I ended up here I got massive lift directly over the airport, and today was no exception; everyone was doing big ears and wingovers etc to get down; there was so much lift. The skies were full of cu's and we could have continued to Bakersfield I'm sure, but we were all so tired that we just wanted to land! Goal was a very happy place to be with nice grass to pack up on and about 12 people in goal...a rather easy task considering. I think I came in 9th or 10th today so I should maintain my 6th place overall (I hope)! It was truly lovely flying, there was some wind but not too much, and the climbs were plentiful, and we got to transition from mountain flying, to foothill flying, to flatland flying, all in one flight! I don't know how often the central valley pops with cu's, but today certainly looked like a special day!